Man, seems like I have waited a lifetime to post this thing but I am officially started. This is my layout for bottom panels (right side) and mid panels (left side). Full 16' panels. I will cover this with plastic sheeting then start laying the strips to match the contour, staple them in place/glue them together. Hopefully, this week end I will become a stripper. Somehow that just doesn't sound right. Last edited by preacher on Sat Jan 01, 2011 9:22 pm, edited 30 times in total. A Preacher with a stripper ...... Ya better say a strip made boat. Especially if any of the congregation is eavesdropping in here. 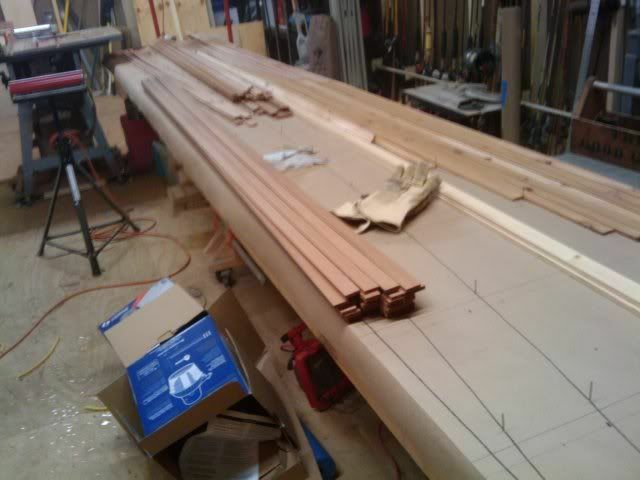 Good luck on the build , it is a ton of fun and more when you get her done and go paddling. WHEW, the unglamorous side of building a stripper. 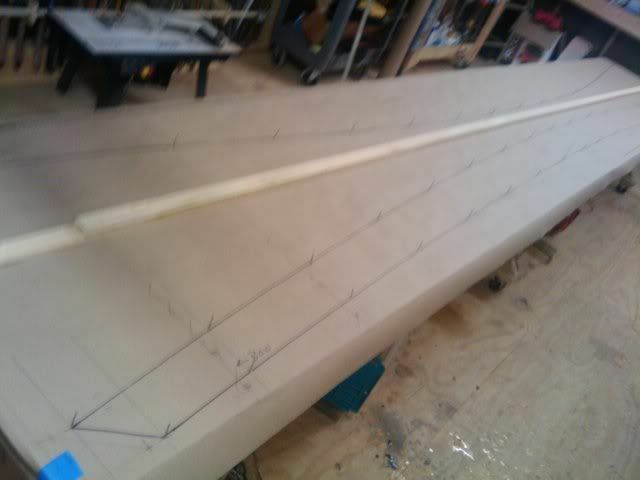 If my calculations are right I have enough strips to do the 6 panels of the hull. Some of the WRC stripped out with a deep rich color which I plan to use for the upper and mid panels. The lighter color ones will fill the pottom panels an be covered with graphite resin. I think I'm going to avoid contrasting patterns, kinda hoping to have a uniform color from the water line (graphite line) and up. 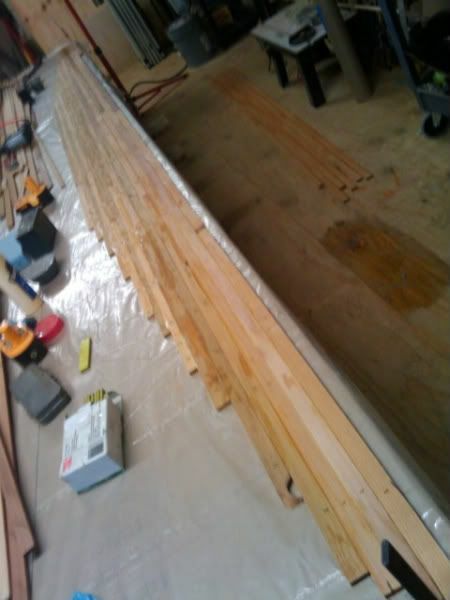 The strips on the right side are laid out over one of the bottom panels. Last edited by preacher on Wed Aug 25, 2010 3:37 pm, edited 1 time in total. My very first stripper panel ever. One more of these then I will do the mid section panels which are already laid out and strips cut. I've been distracted for a while . . . me and an electrician finished putting the wiring in my new shop. 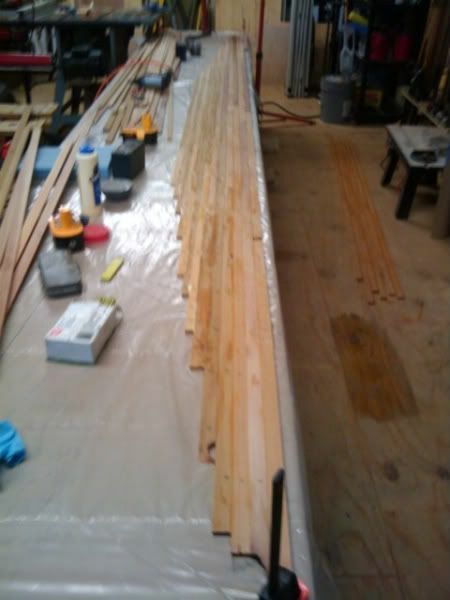 I couldn't believe it would take 1,000 feet of wiring. Neat older gentleman, 81 years young. When we finished he asked for $150.00 for his labor (which was 3 days). I had to argue with him for some time before he would take $300.00 which was dirt cheap. There are still a few people like that left in this world but not many. I also gave him my new pair of compound wire cutters as a Christmas present. What a blessing to not work off extension cords! Good on you with treating the man fair and square and congrats on your 1st panel,any problems with the release My biggest mistake to date was to do my 1st sanding before filling all the tiny holes, they didn't close after wetting out,so 2nd round of sanding needed. First Mid panel (left side of the bench) using the much darker WRC. Took the curve pretty easily. 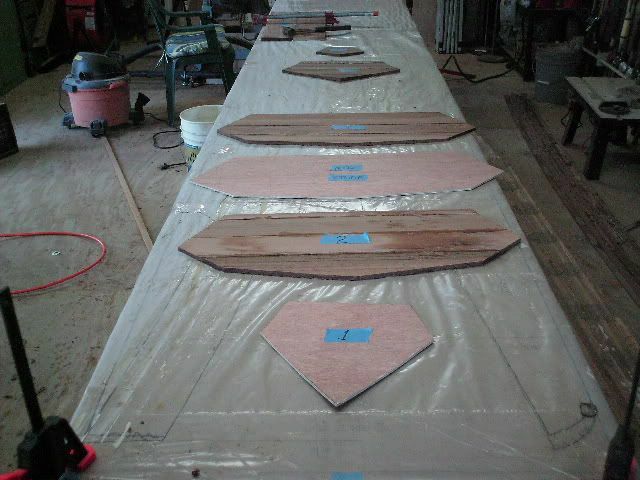 Bottom panels are dried and ready for sanding and then trimming. 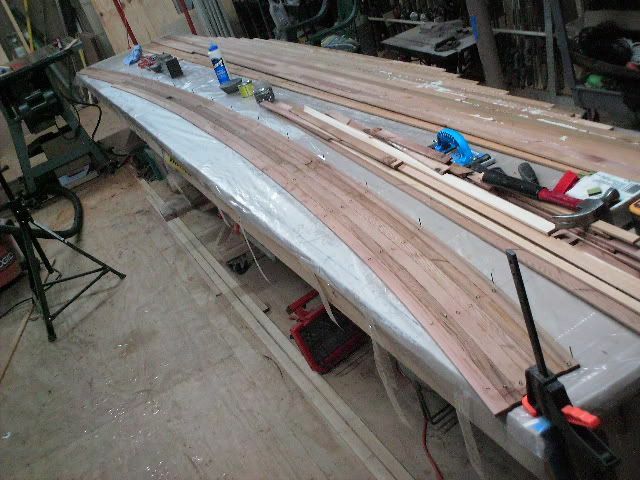 Hopefully I will get the six outside panels completed this week and maybe some of the bulkheads. But, I appreciate you posting and pictures more. It is looking real good. tx river rat wrote: Preacher. I'm excited but my confidence is still lagging. 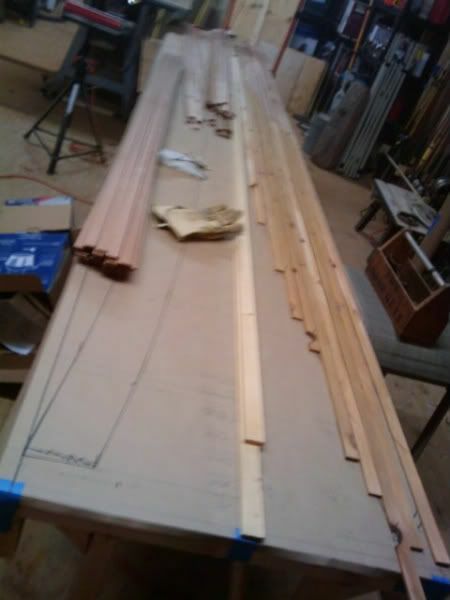 I'm not the finish carpenter that some of you guys are and my learning curve has a giant radius if you know what I mean. I do like the way the wood is looking, especially after I wetted it out to shrimk the staple holes. I am most amazed at how light weight this WRC is when stripped together to form the panels. And, most of all, I'm having a LOT OF FUN. Finished out the Mid and Bottom panels, will sand them today and get them even, and fill the gaps and staple holes that remain. 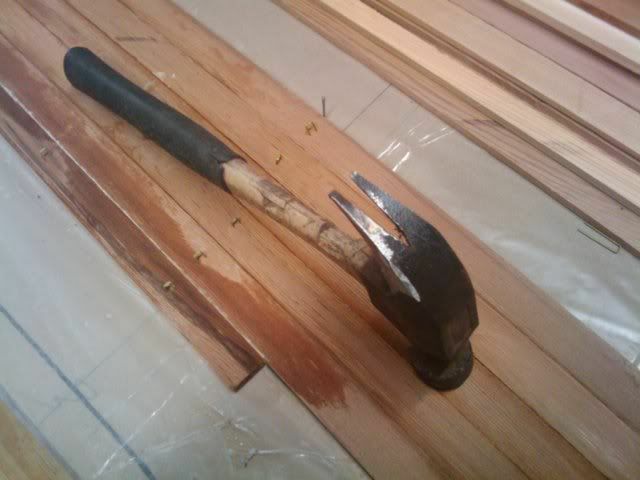 Really got tired of pulling staples with pliars and screw drivers so I took an old hammer and put it to the grinder. Man! That really did speed things up and stopped the accidental gouges. Four panels down and two to go. I think I'm going to work on some of the bulkheads today for a change up. 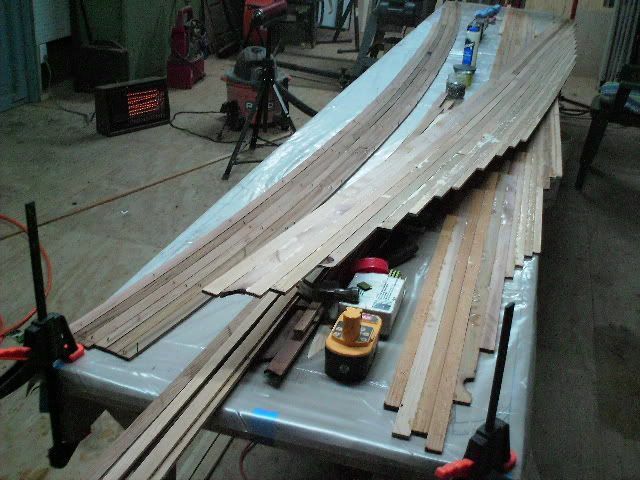 I've cut some wider 1/4 inch thick strips for the transom and the bulkheads. I think they are going to look nice when joined together especially if I mate the strips from the same board. Got the forms drawn up and cut out. I used WRC to do 1, 3, 4, 5 and 6. 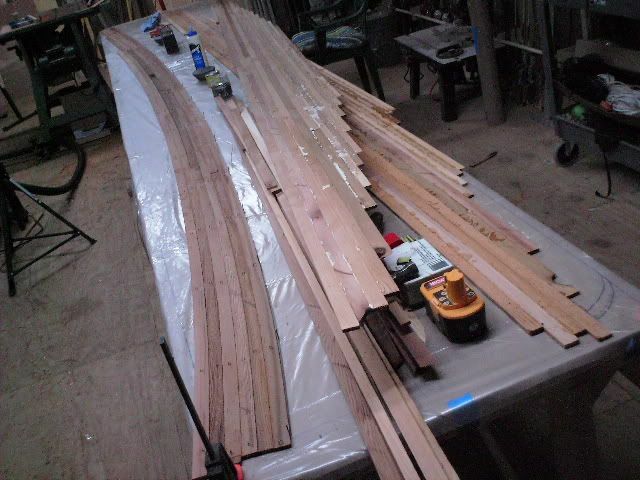 I used Luan ply for form 2 which is under the front deck and the temp form which will be removed. If I can ever get over this pig flu maybe I can get more than 30 minutes work done. This evening or tomorrow I hope to trim the 4 panels I have stripped out down to exact size and sand everything real good and do some filling of a few gaps and holes. 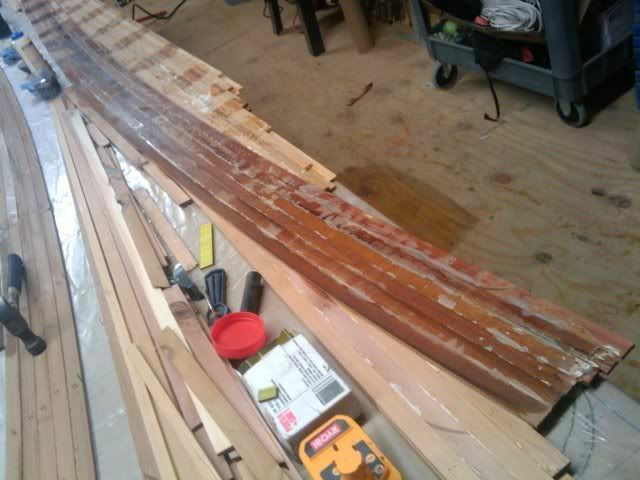 After that I will begin stripping out the last 2 panels. 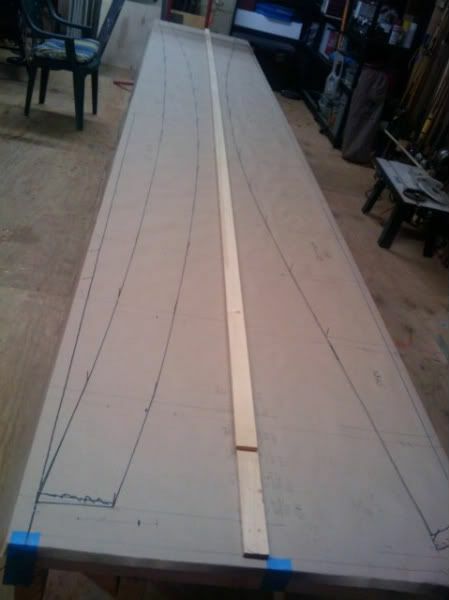 I may have to cut some more strips for the deck, tankwell and cockpit. Matt, I am seriously considering omiting the cockpit scuppers. My size and the amount of equipment I carry could become a problem with scuppers.